Hello, chickens! I hope you are well on your way to a fabulous holiday weekend. I know that this is an early post, but I figured that many of you might not be checking the computer tomorrow, and I wanted to get in a couple good 4th of July recipes for you! I know that I am very much looking forward to a major BBQ bash with family and friends this weekend. But whether you are hosting or bringing something to a pal’s house for their feast, it is a weekend where you need to maybe make large amounts of family-friendly fare. Whomever is manning the grill can use their best recipe for burgers, dogs, ribs, or other stuff. Want to make them the happiest camper ever? Get them this uber-mega grill brush . Steven Raichlen sent it along, and boy does this sucker work! Just don’t try it on your Smokey Joe , because the head is nearly wider than the whole surface of that little munchkin of the back porch grills. But if you or a loved one has a large grill, this is the last brush you will ever need. Charming Suitor is madly in love with it. "This thing is like driving a Lexus. Sure, a Kia will get you there eventually, but the Lexus will do it in a much superior and more comfortable fashion. The one side gets the big junk out of the way so that the little side can really clean. It hits all the little nooks and crannies. And the leverage you get gives you serious torque so it only takes a few swipes to get the job done, and frankly, it is nice to have the extra-long handle so I can really get the grill clean without burning all the hair off my arms. Mondo grill brush." Proteins are usually easy to decide upon for your backyard celebrations, but I often find that we fall down a bit on everything else. So I’m here to save the day on side dishes. I know it is tempting to just buy cole slaw and potato salad. They are everywhere and very easy to just purchase. But I beg of you, give these a try. I promise they will elevate your party, or grace the table of any potluck you may attend. And for a refreshing unexpected side, why not Cold Sesame Noodles? 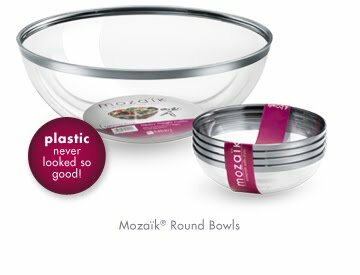 These are your best friend if you have vegetarians coming over, especially since you can grill some thick slabs of firm tofu (marinate in equal parts soy and rice vinegar with a dash of toasted sesame oil for an hour, then brush with oil and grill 2 minutes per side) to place on top. The slaw is my own original recipe, designed to balance rich fatty meats or spicy dishes with ease. And it is a nice change from the gloppy mayo-based slaw you may be used to. 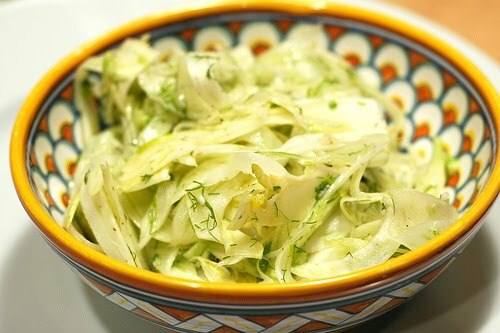 I use this mandoline and this julienne mandoline for this slaw, both are very affordable and make a world of difference in making this a delicate and uniform slaw. You can also use the Swissmar julienne peeler that comes in the set of three to help make this easier. Mix dressing ingredients together till well blended. Toss veggies and apples with dressing till thoroughly coated. Let sit a minimum of 1 hour for flavors to blend, then taste for seasoning and balance. Keep well chilled until time to serve. When CS and I attended a party hosted by our good friend, The King Of Pork, this was his potato salad, a classic version from our pals at Cooks Illustrated . I tweaked it just the tiniest bit, doubling the recipe for starters, and adding a couple little touches. 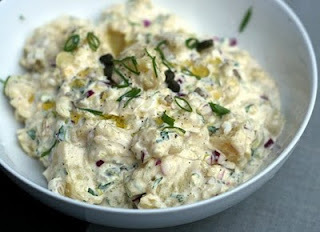 But mostly it is just as they, and TKOP, made it, and it is quite simply the best potato salad I have ever had. Not gooey or soupy, tons of well-balanced flavor, and sure to be a hit for you as well! My Dad is a true potato salad guru, and I made this for father's day and he loved it! 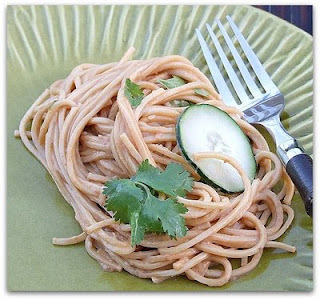 These sesame noodles are one of my desert island dishes, I crave them fortnightly. Lovely Doug makes bowls them every year for his Christmas Party, and I can't get enough of them. He was kind enough to share the recipe, and I made just a couple small alterations for my palate. Cook the noodles; toss with 2 T peanut oil; set aside. Toast the sesame seeds in a large pot. Remove and set aside to cool. In the same pot, saute garlic in 2 T peanut oil; add red pepper flakes and sauté for a minute or two. Add the noodles and the soy mixture. Toss and mix over medium heat just until heated through, and the noodles are well coated with the mixture. Cool to room temperature. Garnish with chopped green onions and sliced, seeded cucumbers. Sprinkle with toasted sesame seeds.